Cherese Mari Laulhere, a precious girl whose life was tragically cut short. Cherese has made it possible to bring Discovery Arts to thousands of children. We are deeply indebted to her precious life. Cherese was someone who wanted to make a difference in the world, and she especially wanted to help children. ​She was a happy girl who loved to sing and dance and had a big beautiful heart. 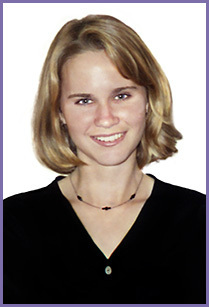 At the age of 21, she was taken tragically in an unnecessary bus accident while in India on a Semester at Sea program. Cherese Mari Laulhere was born at Long Beach Memorial Medical Center on September 17, 1974. She lived and went to school in Long Beach most of her life. Cherese was very active and had many varied interests: she loved to swim, play tennis, run and dance; she enjoyed drama; she co-founded an environmental club at her high school which still exists today; she volunteered for PAWS LA, an organization that assists low-income seniors and people disabled by a life-threatening illness by providing services to help them keep and care for their pets, and she volunteered as a candy stripper at Long Beach Memorial Hospital. Following high school, Cherese went to Cypress Junior College, and then transferred to UCLA. As a sophomore at UCLA, Cherese decided to apply for the “Semester at Sea” program sponsored by the University of Pittsburgh. Cherese was accepted, and joined 550 other students for a 100 day trip around the world, with stops in 9 different countries, while at sea and with study and travel programs in each country. Students had a number of options available for travel within each country. Cherese’s itinerary included a boat trip on the Orinoco River in Venezuela, Carnival in Brazil, visiting a township in South Africa, safari in Nairobi, and visiting an orphanage in Nairobi. Throughout her travel, Cherese talked about how the people that she met in each country touched her heart, especially the little children. She wanted to make a difference in this world, no matter how small. But Cherese’s hopes and dreams were never realized. While in India, travel plans for a trip to the Taj Mahal were changed without advance notice to the students. Instead of traveling by plane, Cherese and others found themselves traveling by bus at night on a very dangerous highway with a driver who had not slept in 30 hours. Tragically, on March 27, 1996, the bus crashed and overturned, and Cherese and three other female students were killed. Cherese was deeply loved and admired by everyone who knew her for her sweet, shy, giving nature, for her ability to see people as they were, without judgement, for her compassion, her humor and her gratitude for all that life gave. And she is missed deeply. In the midst of their grief and profound loss, Cherese’s parents decided it was important to carry out their daughter’s dream of making a difference in this world, especially in the lives of needy children. Larry and Chris established the Cherese Mari Laulhere Foundation, and through it, have truly made a difference, one that embodies the essence of their wonderful daughter. The Cherese Mari Laulhere Foundation has made possible the purchase of a Continuous Venovenous Hemodialysis Pump for the pediatric unit at Miller’s Children Hospital at Long Beach Memorial, Nasal Dysplasia Research at Children’s Hospital of Orange County (CHOC), distribution of Blood Donor Educational Pamphlets for a national Cord Blood Program, and the purchase of new equipment, supplies and facilities improvement for the Tichenor Orthopedic Clinic for Children. Gifts have also been made to PAWS, Miller Children’s Abuse and Intervention Center, Boys and Girls Clubs of America, Kettering Elementary School (where Cherese and her brother Todd went) and Olive Crest Homes & Services for Abused Children. Most recently, we are proud to tell you that she has helped Discovery Arts begin a new program in Springfield, Missouri along with our programs at Miller Children’s Hospital, Jonathan Jaques Children’s Cancer Center at Millers and Children’s Hospital of Orange County. We are also so happy to report that many more lives will be helped by “The Cherese Mari Laulhere Imaging Center " and " The Cherese Mari Laulhere Birthing Center” located in the new hospital at the Miller Children's Hospital in Long Beach. Cherese always said, "I want to make a difference in this world, no matter how small." She told some people during her trip that she wanted to help make a difference in the lives of less fortunate children. Through The Cherese Mari Laulhere Foundation, Discovery Arts has been blessed by Cherese’s loving, giving spirit.